(05-02-2012, 03:23 PM)Ollie Wrote: ...baka nga iyan ang nakitang dahilan para i-pump and dump eh opinion ko yan ha? Well, your opinion Comm is the "Magna Carta" of us newbies....fastest finger wins! sanay sa TEKKEN to Comm...in and out. So let us see...last March 15 PMPC opened at 5.60 high of 6.75 then went down to close at 5.61 due to Corporate disclosure of the Company....Volume was 15,500 shares. Due to ex-date all GTC sell orders last April 30 were removed the 100k of SB Security. Therefore on April 30, there was a bid of 100k at 6 moved to 5.40 and no one even sold even with a bid of 100k shares until before trading closes it totally disappeared. Please note that it was the first time a 100K bid appeared at PMPC. Today - May 2, is the 2nd time that 100k bid appeared. How did I know, I am watching the stock movement as I said at Ruach thread, decades na siyang di gumagalaw. Due to probably some curiosity Optimum Securities sold 500 shares and the broker was revealed as Campos Lanuza. Well somebody bought at 6.75 and the broker is ATR. PMPC is NFB once again. Last April 26, even if the previous close was 6 pesos (April 24 closing no transaction on April 25), a cross sale was made by Campos Lanuza at 5.40. No one moved on the bid and ask side. Who holds the biggest share of PMPC = Optimum Securities. They are the one who did a big cross last year and since then, PMPC was still not moving. Who was buying little by little from March to April? Usually Optimum Eastern First Metro. Unusual na ang volume ni PMPC pag yan nag 3,000 shares. Top Seller of the Day: SB Security ang nakahrang na 100k. Sa ROX before the run up to 3.90 ang harang 1.8M at 2.70 c/o BPI. 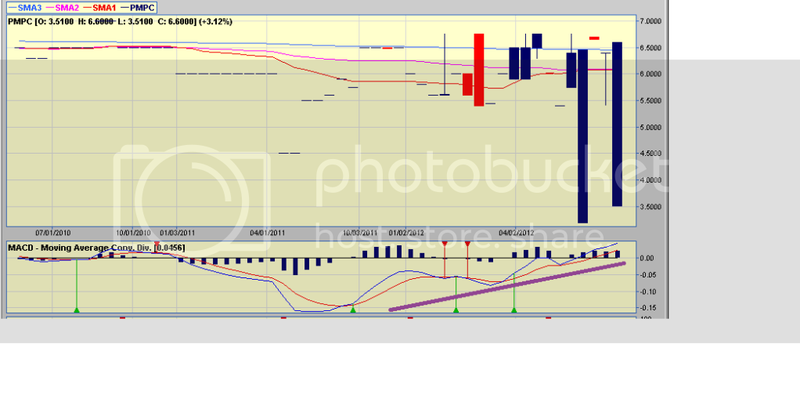 Sa CHI BPI bought up 5M shares before the close last week. Sa FED today may harang ng 20k shares. Sa RFM 4M shares at 2.50. Lahat ng harang pwedeng tibagin sa mga brokers na gutom whether index stocks, 2nd liners, 3rd liners, illiquid stock. Is McDonalds French Fries really here? I don't want to assume unless it was specifically stated. Obviously iba ang Top Buyer ng stock na ito today. Will this be a candidate for hype and dump? Don't know, may nag hype na ba? Check chart for support and resistances and general trend. Historical High of PMPC is 16 pesos. Reminder lang: Know your risk reward ratio, your trading exit before trade entry and how long are you willing to hold and how you view your entry. Kung daytrade lang dapat exit on the same day. No ifs and no buts. This applies to all stocks you are going to enter. A trade can go for you and against you. Yan may news ulit. May tapal na sa baba. Di ko lang alam kung nakita mo na possible na may tapalan sa taas. Yung ibang stocks, ceiling bago mag flooring. Eto naman nauna ang flooring. Is the expansion because of this? Sony Corp. (6758) and Panasonic Corp. (6752) are discussing possible collaboration on making televisions that use new OLED technology, an official at one of the companies said. The two companies have held preliminary talks on a potential tie-up to make TVs with organic light-emitting diode displays, the official said, declining to be named because the discussions are private. Mam Ruach are you still monitoring this stock? PMPC has become liquid again because of a recent block sale between RCBC Sec and HDI, and by the dumping of Papa Sec in the open market. The book value remains the same and the PE Ratio has gone down to 18 since the priced dropped from 6 to 3.48. PD: I have some PMPC wag gumaya, highly illiquid ito. Cross sale si ATR Kim Eng ng 1,105,000 at 3.45. Ang tanong, pataas o pababa yung pagtulak sa presyo? I'm looking out for PMPC's daily volume. It seems to be back from the dead after so many years. Also, Papa Securities which kept dumping shares lately is nowhere to be seen today. Kababanggit mo pa lang bro eh lumipad na. Biglang humataw hanggang 4.00 haha. Sentiment buying yan senor ingat at wag mag panic buy. As far as the public is concerned, there is no material news that warrants a rise in stock price. There was news today that Panasonic doubled its net income but that's not really an earth shaking event. The reason I'm watching Panasonic is because its way below its book value of 8 php. Also, to quote my conversation with Senor Spyfrat, retained earnings of PMPC is around 3 billion php. For a company with a market cap of only 1.5 billion php, that's a little bit enticing. I'm also watching out for Panasonic's deal with Tesla Motors to be the sole manufacturer of its lithium batteries. Those are my viewpoints on this said stock. Not an endorsement to buy or sell.